This proud Johorean was schooled at Dato Jaafar Boys School. A sportsman in his younger (and slimmer) days, he played hockey and cricket, the former at state level. Led a colourful student life for 8 years in England and a couple more travelling through Africa. Upon satiating his travel appetite, he decided to buckle down and give the legal world a try by reading law. 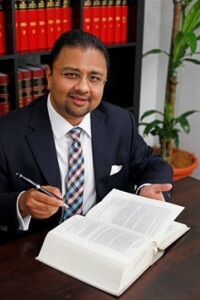 He began pupillage under Dato’ Seri Krishna Kumar in 2005. He subsequently joined Chooi & Company and spent 4 years there, leaving in 2011 as a Senior Associate to become a founding partner of Messrs Raj, Ong & Yudistra. In his work, he’s known for his practical approach. He is big on a fact-based, realistic-solution oriented approach to litigation. His primary focus is on corporate disputes. And, he is experienced in complex tortious matters. He is also a qualified trainer for the Bar Council’s International Advocacy Training Council courses. When he steps out of his robes, he embraces fully the philosophy of carpe diem – learning new cultures and lunging himself into new experiences (often with disastrous consequences). A purveyor of fine tastes, he has a low tolerance for food that is not of gourmet level, music not played from a vinyl player, brogue shoes not from Crockett & Jones, suits not bespoke, and tobacco not of a fine cut. He is also known to be occasionally grumpy (in truth he always is).